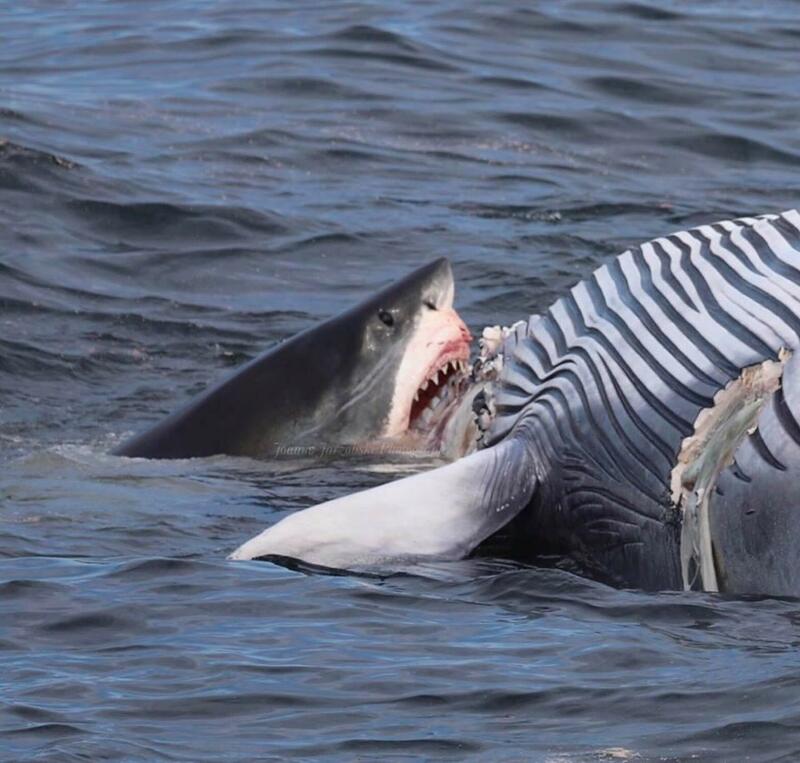 An 18-foot great white shark eating a dead fin whale in Cape Cod. Passengers aboard a whale-watching boat were stunned Sunday when they witnessed a massive great white shark and another smaller one chomping on a dead fin whale floating in Cape Cod Bay, a marine biologist said. About 160 passengers on the Hyannis whale-watching cruise were “in complete awe,” said Joanne Jarzobski, marine biologist on the boat. She estimated the shark’s length at about 18 feet — about the same as a Chevy Suburban — and could even have been a few feet longer. “Getting the opportunity to see a great white shark in action is truly a once-in-a-lifetime experience for our passengers and crew,” Jarzobski said. She added that she and the crew were also shocked to see the apex predator scavenge the dead whale. Prior to the boat’s departure, Jarzobski said, the state Division of Marine Fisheries and the Center for Coastal Studies in Provincetown reached out to tell her a whale was floating in the bay. She was asked to document it on the boat’s way out to its whale-watching tour. The boat sailed approximately seven miles north of Barnstable Harbor when around noon it came upon the sharks eating the carcass. Although the sight came as a shock to most, dead whales are part of a shark’s natural diet. Jarzobski said sharks help break down the whale and recycle the nutrients back into the ocean system. The whale was belly up as the two sharks shared their meal, Jarzobski said. She said she didn’t know how the whale died. Researchers from the Center for Coastal Studies are trying to identify the whale and determine why it died, Jarzobski said.